The Perfect Valentine's Day Gift! Only $2.99. 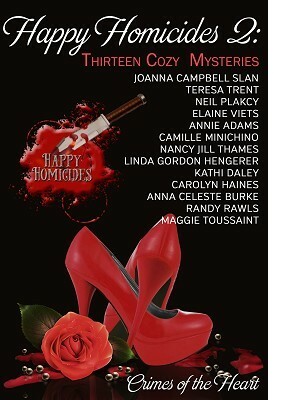 Book 2 in the bestselling Happy Homicides Anthology Series. Available for a limited time at this low price. Thirteen mysteries (600-plus pages) by thirteen bestselling and award-winning authors. With free bonus file of recipes and craft ideas. These clean mysteries detail crimes of the heart. Authors--Joanna Campbell Slan, Teresa Trent, Neil Plakcy, Elaine Viets, Annie Adams, Camille Minichino, Nancy Jill Thames, Linda Gordon Hengerer, Kathi Daley, Carolyn Haines, Anna Celeste Burke, Randy Rawls, and Maggie Touissant.